I tend to wear nail polish in the summer months because I prefer painting my toes to finger nails. In the winter months my feet rarely see daylight from socks and boots. 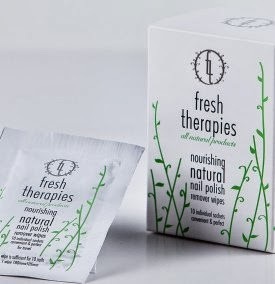 Having said that I still need something to remove the polish and since discovering Fresh Therapies Natural Nail Polish Remover in 2012, it's the only remover I use. I haven't felt the need to branch out and try alternative brands because I am impressed and happy with this one. I gave a mention in my September Empties Video that Nicola had launched nail polish remover wipes and I was giving them a try. These are very handy for travelling or if like me you are a clumsy person, then this way you are guaranteed zero spillages. The wipes are infused with the same ingredients as the liquid version, no nasty ingredients and still the same fresh lime fragrance. The claim is one sachet wipe can remove polish from ten nails and I have achieved this without any issues. This is great! So convenient for travel, great post.